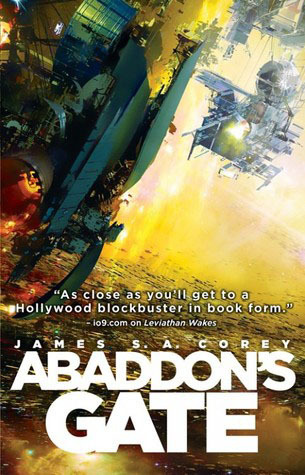 Ever since I read Leviathan Wakes, I’ve become a fan and follower of the team behind the pseudonym James S.A. Corey — authors Daniel Abraham and Ty Franck. The Expanse series is the most fun I’ve had with a space opera in a long time, and from what I heard there may be more novels and short stories to come set in this universe. I sure hope so, and there’s also apparently a couple Star Wars novel projects by them in the works, which makes me fantastically excited. Anyway, coming back to my thoughts on Abaddon’s Gate, this book is the third installment of Expanse, so as a caveat there may be mild spoilers in this review for the first two books in the series. The story continues with the adventures (and misadventures) of the crew of the Rocinante; things are never boring for Jim Holden and his team. The mysterious proto-molecule that had been uncovered and released into the solar system has somehow created a massive ring structure just outside the orbit of Uranus. It appears to be a gate leading to a dark void on the other side, and the Rocinante finds itself joining a vast flotilla of science and military ships venturing out to study it. However, Holden’s involvement is no accident. Unseen forces and players have been pulling the strings behind the scenes to get him and his crew right where they’re supposed to be. Admittedly, I thought Abaddon’s Gate was quite slow to start, but so far I’m finding that to be the pattern for all the books in this series. I likened the pacing of the first couple of books to a ride on a really tall roller coaster, where you spend a lot of time doing a slow climb to the apex before the excitement and thrills can truly begin in earnest. Using this metaphor, I would say that this book was about 75% chugging up the lift hill — the first three-quarters of it did not wow me at all, and at times even annoyed or frustrated me, but I recognized it all as the necessary story and character build-up. The remainder of the book, however, was all good stuff — the roller coaster’s loops, dips, corkscrews, etc. so to speak. I could not put it down. I think I stayed up late and burned through the rest of the novel in an hour and a half at this point, when reading everything that came before probably took me three days. The last 25% was just so damn good, it warranted a rating bump by one whole star from me because of it. One other comment I’d like to make pertains to the characters. The stories in these books are told through the points-of-view of multiple characters, each chapter focusing on the perspective of one person and alternative or cycling through the players. The names of these key players have changed up throughout the course of the series, with the exception of Holden, whose POV has remained a constant perspective in all three books. In spite of this, however, I can’t say that his character has ever truly grown on me; instead, my interest has always been bolstered by my enjoyment for the other POVs. For example, in Leviathan Wakes, it was Miller. He wasn’t in the next book, Caliban’s War, but there I had Chrisjen Avasarala, my favorite potty-mouthed UN politician. In Abaddon’s Gate, however, I didn’t develop that kind of liking or connection for any one on the new players. Melba/Clarissa? Her character and story was kind of whacky, and felt a little forced and rushed. Bull? His POV was slightly better, but only because his character really stepped up during the book’s climax and final showdown. And Anna? I could not stand her self-righteous moralizing and idealistic naivete at all. Of course, all the characters are the way they are because they have their own roles to play; I understood that, but the lack of a good character for me to really get excited for was still mildly disappointing. I want to end this review on a positive note, though, and the good news is that for anyone who has been following this series, Abaddon’s Gate as a sequel is definitely worth picking up. It continues the mysterious plot of the protomolecule and answers some questions while posing more others. The ending to this leaves so much potential. Whatever happens, I really hope we won’t have long to wait to find out.